This amount does not include extra costs involved in education either – and we all know these add up: things like books, trips, uniforms and after-school activities. Add in the cost of three years at a British university (as an example) and your cost per child then goes up to Dhs938,599. The research has discovered that 64% of parents are willing to go into debt to fund their child’s education. The study comes from Zurich Middle East, an insurance company. 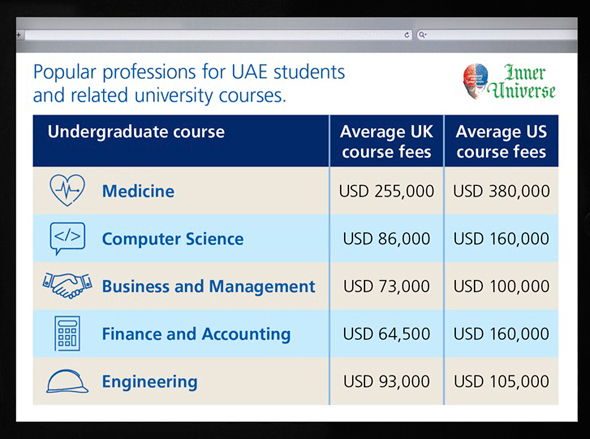 They also did a survey to find out what the most popular university degree areas were for children in the UAE – and they found that they were medicine, computer science, business and management, finance and accounting, and engineering. Worried about funding your little one’s education? Zurich has a savings calculator here where you can figure out how much you’ll need to save.